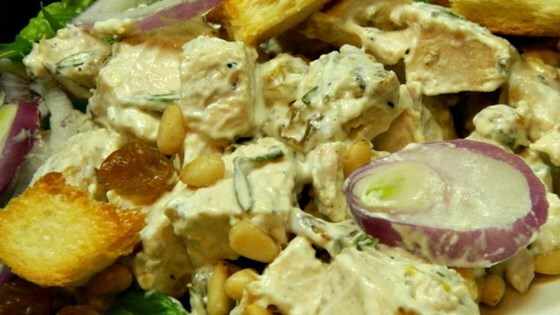 "This chicken salad recipe with pine nuts and raisins has a honey mustard style dressing and is topped with onions and croutons. If you don't have olive oil spray, you can just use any non-stick cooking spray." Preheat oven to 350 degrees F (175 degrees C). Spray a baking sheet with olive oil or non-stick cooking spray. Prepare the croutons by spreading bread cubes over prepared baking sheet. Lightly spray cubes with oil or cooking spray and bake for 20 minutes or until golden brown. Remove from oven and cool. Prepare the dressing by whisking together the sour cream, mayonnaise, lemon juice, mustard, honey, rosemary, salt and pepper. Cover and refrigerate until ready to serve. Prepare the salad by placing the chicken in a pan and cover with water. Bring just to a boil, cover and reduce the heat to medium-low. Cook 10 minutes, or until chicken is cooked through. Remove from heat, drain and cool; dice or pull into shreds. Combine the chicken with the celery, raisins and lemon peel. When ready to serve, stir together the lemon juice and olive oil. Tear the lettuce into small pieces and toss with the lemon and oil mixture. Divide between plates and top with the chicken salad. Garnish with onion rings, a sprinkling of pine nuts and the croutons. I used this recipe to create a chicken salad for a sandwich. It was a good base for a chicken salad. I ended up adding other ingredients to beef it up a little.